Things are looking good for SWAT and 9JKL. Today, CBS announced they’ve ordered additional episodes for the two freshman TV series. 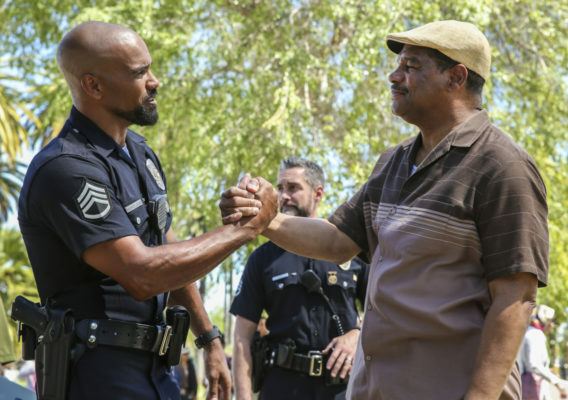 A cop drama, SWAT centers on Sergeant Daniel “Hondo” Harrelson (Shemar Moore), a lifetime Los Angeles local and former Marine, Hondo has been tapped to lead a new “last stop” Special Weapons and Tactics unit. The cast also includes Stephanie Sigman, Alex Russell, Jay Harrington, Lina Esco, Kenny Johnson, and Peter Onorati. Meanwhile, 9JKL is a sitcom loosely based on a moment in star Mark Feuerstein’s life when he lived next door to both his parents and his brother. The cast also includes David Walton, Elliott Gould, Linda Lavin, Liza Lapira, Matt Murray, and Albert Tsai. CBS has ordered three additional episodes for 9JKL and given SWAT a full season order, bringing the latter’s total to 20 episodes. What do you think? Have you seen SWAT and/or 9JKL? Do you hope they get renewed? More about: 9JKL, 9JKL: canceled or renewed?, CBS TV shows: canceled or renewed?, SWAT, SWAT: canceled or renewed? 9JKL could develop into something better. One of the first things they need to do is lose the canned laughter. Give it a few more episodes for the characters to develop and maybe it could have a future. Again – lose the canned laughter! I love S.W.A.T. I never miss an episode. The acting is awesome. I always have good feelings at the end of each show. Shemar is a great actor and believable!! The writers are exceptional. Please don’t cancel this show. I am sorry to be so disappointed in the show. Was really looking forward to it too. I just find the directing to be lacking , and much of the acting quite wooden. I’d prefer to see Shemar back on Criminal Minds…but, when I see the rating numbers here, don’t think it will happen. Really disappointed. Love swat keep it coming. Both shows are better than I expected. I start, unfortunately, with the attitude of not getting attached because they will just get pulled. We are not allowed time to get into a show any more. Our viewing habits have changed but their calculations don’t so bye bye shows. I enjoy both shows but S.W.A.T. would be my favorite. Thank you. That’s great news for S.W.A.T. ! Can’t wait to see the character and story development. It seems each episode gets better and better. Bravo!